My husband Nigel and I started breeding pure Cleveland Bays in 1994. After a few ups and downs Holly (Highpasture Hawlmark) was our first foal born in 1998. You can imagine our delight when in 2000, as a two year old, she took the Breed Championship at the Great Yorkshire Show, “the home of the breed”. We had tried to put Holly in foal in 2001 but had been thwarted by foot and mouth. 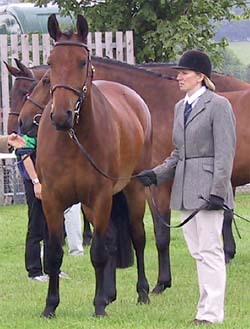 In 2002 we tried again and sent Holly to a favourite stallion based on the east coast of North Yorkshire. Holly was scanned in foal at stud but shortly after we were told she was losing condition and it caused their vet some concern. The vet diagnosed peritonitis and we arranged to bring her home. She had lost the foal by then. At home our own vet quickly spotted the dreaded symptoms of Grass Sickness and she was immediately hospitalised and the chronic form of the disease was confirmed. Thankfully, despite her poor condition, she continued to nibble grass and this gave us some hope in an otherwise bleak outlook, with the vet indicating that survival was unlikely. After a week of rehydration and observation the vet decided that there was little more he could do and so it was down to us to nurse her through, although the vet was still not optimistic and said the chances of survival were slim. We searched the Internet for any help we could find and found the EGSF website and the Fund secretary, Joyce McIntosh, who gave us valuable advice. It was so reassuring to speak to someone who knew exactly what we were going through. Having spoken to Joyce and thrown away the horse manual on guides to feeding, it was a question of anything goes to try and get Holly to eat. It was a painfully slow process of many distressing failed attempts but even getting one mouthful into her was progress. We fed her every 2 hours night and day for 5 weeks with a sloppy porridge of Dodson and Horrell’s Build Up and Pasture Mix but just when hope was lifting she decided to stop eating! With winter approaching and grass declining (which she was still eating even though it still came back down her nose), desperation once more crept in. One evening we attended an event at our local feed merchant and spoke to many feed suppliers who freely gave advice and samples to help us try alternatives. We spoke to Nicola Tyler from “Top Spec” who was able to provide nutritional advice which challenged some of our attempts to date and gave us some new options to try with Holly. The next day we started to give Holly an appetite stimulant and a probiotic recommended by Nicola and we cut out molasses based products which we thought had at one time helped. We quickly found Holly’s appetite returning for feed and over the next few weeks as the weather worsened Holly maintained and slowly gained weight, despite the diminishing grass. She still choked, had nasal blockages and couldn’t eat hay/haylage, but well soaked hard feed and grass was ok. On this basis we decided she had to live out during the winter with rugs and a field shelter, to eat what grass she could. Holly continued to improve and by January was nibbling Haylage albeit choking occasionally, but her weight was returning to normal. She was stiff in her back and movement but these were the least of our worries. She has continued to improve since then and whilst not the Yorkshire Show Champion that she was, is getting there. We took the decision to try to breed from her again this year in view of her remarkable recovery and our fingers are firmly crossed. We decided to show her at the Great Yorkshire Show this year, with three other of our Clevelands, in the hope that it would inspire others with the same problems that we faced. Holly finished fifth in a large mare class but the result was irrelevant. We are lucky to have her at all. We hope this story does give hope to others in a similar position. We owe a great deal to both Joyce and Nicola for their invaluable support at a very difficult time for us. We kept a diary of all the ups and downs if anyone would like to contact us either at highpasture.clevelands@virgin.net or 01423 770270.